The Queensland Art Gallery │Gallery of Modern Art (QAGOMA) has unveiled a new permanent display of Indigenous Australian art: ‘Everywhen Everywhere’, which opened last Saturday, 18 October. QAGOMA Director Chris Saines said the collection-based exhibition, curated by the Gallery’s curator of Indigenous Australian Art, Bruce McLean, is presenting historical and contemporary works by Aboriginal and Torres Strait Islander artists in a prominent and permanent location in the Gallery. ‘The concept of ‘Everywhen Everywhere’ borrows from anthropologist and W. E. H Stanner’s explanation of The Dreaming as a sacred, heroic time of the indefinitely remote past that is also, in a sense, part of the present. Stanner suggests that The Dreaming cannot be fixed in time, so we have presented the Gallery’s Indigenous Australian art collection in a non-chronological way,’ said Mr Saines. Curator Bruce McLean said ‘Everywhen Everywhere’ spoke to an Indigenous understanding of Aboriginal and Torres Strait Islander country, from ancestral narratives to contemporary political movements across the continent. Together the works reflect that the things that have happened to Indigenous people over the past 200 years are of as much importance to Indigenous experience and existence today, and into the future, as the deeds of the great ancestors from times immemorial,’ Mr McLean said. Highlights of the installation include an impressive group of Thap Yongk (law poles) (2002-03) by Kugu (West Cape York) artist Joe Ngallametta; DISPERSED (2008), a text-based installation in laminated wood, cast aluminium and .303 inch calibre bullets by Badtjala (Fraser Island) artist Fiona Foley, and Up in the Heavens the Gods contemplate their next move (2011), by Cairns based Kala Lagaw Yu (Torres Strait) artist Brian Robinson, which is suspended from the gallery ceiling. In addition to 1970s Papunya boards by Kaapa Mbitjana Tjampitjinpa, Shorty Lungkata Tjungarrayi and Mick Namarari Tjapaltjarri, works by Albert Namatjira and members of the Hermannsburg School that followed him are featured, celebrating Namatjira’s role in Aboriginal and Australian art history. In 1947 Namatjira become the first artist of Aboriginal heritage to have a work acquired for the Queensland State Collection. 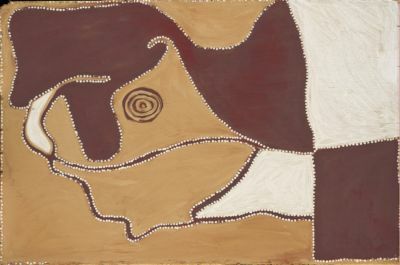 ‘Everywhen Everywhere’ also includes bark paintings by Anindilyakwa artists commissioned in the 1940s by anthropologist JP Mountford at Groote Eyelandt that depict local ancestral narratives and body painting designs associated with trade winds – an historically significant body of work distinctly different from works produced by present-day Arnhemland communities. 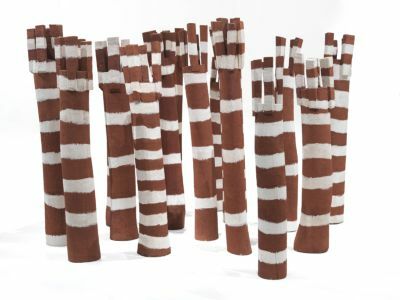 A group of seventeen Lorrkon/larrakitj (Hollow log memorial poles) by Yolngu artists including Gulumbu Yunupingu, Djambawa Marawili and John Bulunbulun feature alongside important paintings by Trevor Nickolls, Lin Onus and Rover Thomas and Embassy 2013, a recently acquired installation by Richard Bell. Audiences can enter Richard Bell’s tent, which is based on the Aboriginal Tent Embassy, often cited as the spiritual epicentre for Aboriginal and Torres Strait Islander empowerment struggles from the 1970s, and watch Imagining Victory, a video trilogy that invites the viewer to think about the history of Aboriginal people’s struggle for justice. Rover THOMAS, Kukatja/Wangkajunga 'Blue tongue lizard' (1984) Natural pigments and synthetic polymer paint on board / Purchased 1997. Archie MOORE, Queensland b.1970 'Sacred sights (The first intervention)' (2008). 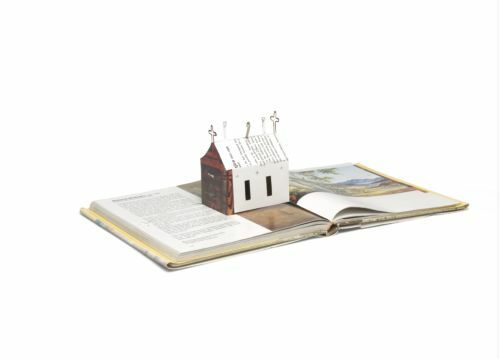 Folded book. Purchased 2008.